A nice patch of grass is a necessity for many outdoor activities. I usually design the grass as a separate outdoor living space. The trick is to be able to keep your patch of grass looking healthy in drought conditions and still be able to conserve on water. There are as many philosophies about how to do that as there are people who are watering their lawn. I do consider myself an expert and, through my research and experience I have come up with my own philosophies which have proven quite successful. 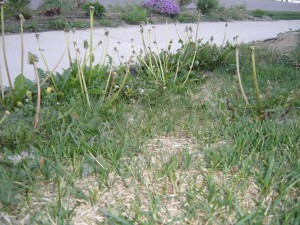 For instance, I was able to cut back the water usage on one particular apartment complex in the Denver, Colorado area by 700,000 gallons during the month of July—the hottest month of the year—kept the lawn looking amazing, and still followed all of the very strict watering regulations imposed by the local government. Since that time, my water scheduling abilities have improved even more. The number one most important thing in establishing a drought tolerant lawn is root depth. If you can develop a deep root system, you can water less frequently and you will use less water to do so. I feel it important to mention that, to develop a deep root system, you need to implement other cultural practices besides proper watering—although proper watering will have the biggest impact on the root depth. Some of these practices include mowing at 2.5” or higher, a proper fertilizing program, and yearly aeration. You might also consider good, fine-grade mulch for your lawn in order to amend the soil and improve the soil structure. All of these things will help your watering practices to be more effective. There are several things to keep in mind when scheduling your watering. I think it is best to address these things by introducing the problems associated with solutions so that you can understand the process of scheduling and be able to do it yourself. Some of the problems are shallow watering, over-watering, and heat-stress on the roots. I will address each of these problems in a separate blog in this three part series. Shallow watering is a problem because the roots of your grass will only grow where the water can be found. Roots that are shallow require more frequent watering and are prone to heat-stress. Shallow watering is more commonly a problem in heavier clay soils than in sandy soils, though it is feasibly possible to water too little in sand. The cause of this problem is actually quite ironic because it is more often caused by run times that are too long as opposed to run times that are too short. The soil is like a sponge and, when fully saturated, it can not accept more water. Thus, when you continue to apply more water to a saturated soil, you are only watering the sidewalk, driveway, or low spots in your yard, because the surplus runs off and follows the path of least resistance. One way to help this problem is to apply a thin layer of fine-grade mulch as a soil amendment to the surface. This will both help retain the water now, and improve the soil structure so that it can accept more water in the future. The watering practice to implement here is called cycle/soak. What that means is you fill the soil to saturation, and then wait for the water to soak down into the soil profile for a while, and then water again. This will slowly deepen the water level in the soil and therefore provide deeper water for the roots to chase down, deepening your root system. This is done by first, observing how long you can run your sprinklers before it begins to puddle or run off on to the surrounding surfaces, then waiting for at least an hour and testing the soil by inserting a long screw driver (a soil probe is ideal if you have one) to see how deep the water soaked down. The goal is to water down to about one foot. If the first application of water falls short of the target depth, set a second and/or third start time on your timer to water. Remember that as your roots are developing and growing deeper, any water that is more than about one to two inches deeper than your roots is wasted. Conserve water by knowing how deep your roots are and only watering one to two inches deeper than your roots, with about one foot being the final goal. Following these steps will help to prevent shallow watering.